We love Virtua Tennis, but can a pro tennis star summon a group of dancing aliens to distract his opponent? Unlikely. That%26rsquo;s why we love Sega Superstars Tennis. It takes all of VT%26rsquo;s best bits - the simple controls, the ball physics, the minigames - and sprinkles them with Sega magic, turning it into an explosive kaleidoscope of silly fun. Being supersonic hedgehogs and tiny ball-dwelling monkeys will always be more fun than blokes in headbands. 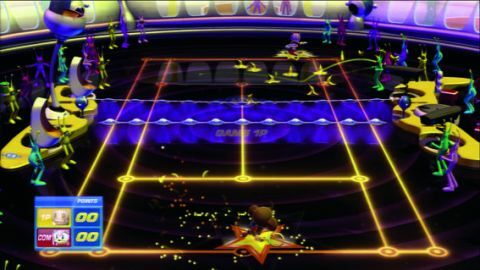 The game%26rsquo;s hub is Planet Superstars - a multi-coloured portal leading to dozens of exhibition tournaments, singles matches, doubles matches and preposterous Sega-styled minigames. Each area is themed after a famous Sega franchise - the Curien Mansion from the House of the Dead series, Sonic%26rsquo;s Green Hill Zone, Coconut Beach from OutRun - and has challenges specific to its theme. So in Green Hill Zone you compete against the clock to collect rings while in the House of the Dead stage you smack zombies with tennis rackets - most of the challenges are marvelously addictive. In Planet Superstars mode (Story mode, basically) you%26rsquo;re rated for your performance, and you will get addicted to trying to score AAA on every challenge. The difficulty curve is well-pitched, and highly engaging. For example, Sonic%26rsquo;s first mission sees you simply collecting rings and dodging projectiles. But later you have to collect the rings in a certain order. Then the rings are moving. Then there are more projectiles. Then you have to collect them in a certain order while they%26rsquo;re moving. It%26rsquo;s delightfully frantic, and also makes you better at regular tennis matches as it lets you get used to your chosen character%26rsquo;s speed and movement style. Each varies greatly. They have basic classes - all-rounder, speed, power, control - but each one has subtle differences. NiGHTS, for example, can fly - but it makes lining shots up harder as he%26rsquo;s floating above the ground all the time. Description Eat your heart out, Virtua Tennis - Sonic and his friends have got more game than you could ever hope for.